Biodiesel producer Lake Erie Biofuels LLC doing business as Hero BX announced Nov. 17 that it has acquired the assets of the former Veros Energy biodiesel refinery in Moundville, Alabama. The plant will be operated under the name Hero BX Alabama LLC. Brazil's special committee on national development unanimously approved a senate bill Nov. 11 that mandates 7 percent biodiesel, increasing to 10 percent within three years, citing biodiesel's positive environmental and economic benefits. Nearly two years after the project was announced, a 5 MMgy supercritical biodiesel plant in Annawan, Illinois, is operational. Designed and built by Jatrodiesel Inc., the innovative facility is co-located with a 125 MMgy CHS-owned ethanol refinery. 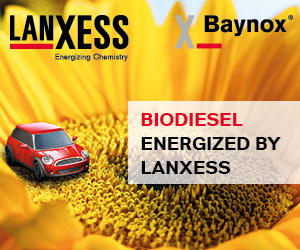 At October's end, Germany's wholesale price for biodiesel stood at around 75.60 euro cents per liter (USD $3.066 per gallon), excluding energy tax, exceeding the price for agricultural diesel by nearly 10 euro cents per liter (USD $0.416 per gallon). According to the U.S. Energy Information Administration, 10 renewable diesel plants currently exist across the globe, and five more projects are under development. In 2014, worldwide renewable diesel production approached 1.2 billion gallons. 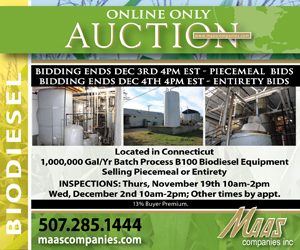 Maas Companies will auction surplus biodiesel process equipment for Biodiesel One Ltd. via a timed online auction ending Dec. 3 for piecemeal offers and Dec. 4 for entirety offers. The equipment is located in Southington, Connecticut. Cowichan Energy Alternatives, the Cowichan Bio-Diesel Co-op and the Cowichan Valley Regional District are holding a ceremony Nov. 19 to celebrate Vancouver Island's first Green & Go Biofuel Station where users can fill up on biodiesel blends. Nearly 100 biodiesel leaders from across the country will press lawmakers on Capitol Hill Nov. 17 to reinstate the biodiesel tax incentive as a domestic production credit in line with a proposal passed unanimously by the Senate Finance Committee. BDI-BioEnergy International started a new business segment in Q3 and began construction of an industrial plant for production of algae products. BDI was also commissioned with construction of a biodiesel plant in the U.K., worth 30 million euros. Joule, technology developer of liquid fuels from recycled CO2, and Red Rock Biofuels, a developer of renewable jet and diesel fuel biorefineries, announced their intent to merge. The transaction is expected to close by mid-December. Renewable diesel producer Neste is working with Boeing to achieve ASTM standard approval for high freezing point biojet fuel, along with the parallel goals of gaining widespread market acceptance and progressing sustainability accreditation efforts.